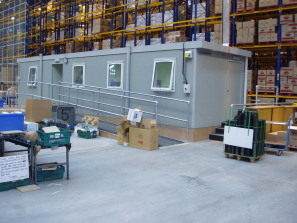 If you are searching for portable office buildings then look no further than the experts at Modular Direct. They have many years experience in the provision of prefabricated buildings that are perfect for temporary and/or permanent office buildings and will complement your business premises and existing buildings at a much lower cost than traditional building work would command. The team at Modular Direct are all highly trained to assist you with providing the very best advice regarding the design of your portable office building. They are dedicated to providing the highest standard of customer service to ensure that you are 100% satisfied with your new prefabricated building. Not only are portable office buildings a flexible alternative to traditional brick built buildings, they are also more cost effective and installation can take place far more quickly than having another office traditionally built which means that your employees can be within their new office space far more quickly than choosing the alternative. To find out more about portable office buildings from Modular Direct, give them a call today on 01482 881700.